This conference will bring together different international research approaches looking at how the optical lantern (‘art of projection’) and cinematography were used in the context of the Social Question around 1900. The media history relevance of the Social Question to the establishment of these new visual media has hardly so far been examined. Nor have these media been critically investigated as social history sources. The conference aims to make a fundamental contribution towards establishing an innovative field of research in the area where social history and media history overlap. The rapid success of ‘cinematography’ at the beginning of the twentieth century owed much to what was known as the ‘art of projection’. The screen became firmly established as a part of international cultural life in the second half of the nineteenth century by the ‘art of projection’. The enormous creative potential of these new visual media in public performances was used not only for commercial purposes, but also for events in areas such as education, religion, and social policy. The interdisciplinary comparison will discuss the state of research on the motifs, production, dissemination, and reception of the projection media in the field of poor relief and social policy. Different methodological concepts will be introduced for researching the performative potential of existing scripts and artefacts (glass slides, films, projectors). In addition, projects editing sources will be presented, and new processes for digitally reproducing and documenting historical sources and artefacts will be discussed. Martin Loiperdinger (Trier): The Social Impact of Screen Culture 1880 – 1914. Stephen Bottomore (Bangkok): The Lantern and Early Film for Social and Political Uses. Frank Gray (Brighton): The Lucerna Network for the History of Projection. Ine van Dooren (Brighton): Archiving and preserving lantern slides and related resources. Richard Crangle (Exeter): Digitizing the History of Screen Culture: The Lucerna Database. 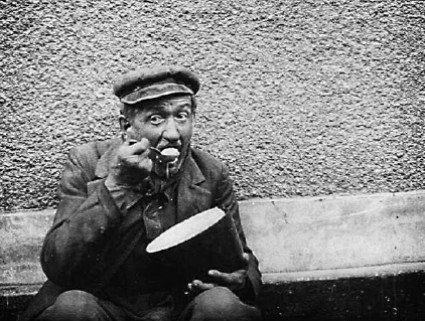 Ludwig Vogl-Bienek (Trier): Slum Life and Living Conditions of the Poor in Fictional and Documentary Lantern Slide Sets. Joss Marsh (Bloomington) / David Francis (Bloomington): “Poetry of Poverty” – The Magic Lantern and the Ballads of George R. Sims. Bonnie Yochelson (New York): Jacob Riis, His Photographs, and Poverty in New York, 1888-1914. Karen Eifler (Trier): Free Meals and Lantern Shows: Charitable Events in Great Britain and Germany. Judith Thissen (Utrecht): Educating Moyshe: Jewish Socialists, Gentile Entertainments, and the Future of the Jewish Immigrant Masses in America. Caroline Henkes (Trier): Early Christmas Films in the Tradition of the Magic Lantern. Annemarie McAllister (Preston): The Promotion of Temperance by means of the Magic Lantern. Marina Dahlquist (Göteborg): Health Entrepreneurs: American Screen Practices in the 1910s. Michelle Lamuniere (Harvard University): From Jacob Riis’s Lantern Slide Presentations to Harvard University’s Social Museum. Spaces are limited (with all those speakers they can’t have much space left) and those interested to register should contact the organisers via this link.